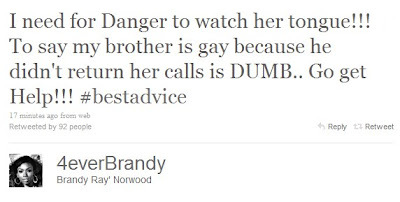 ashlee nicole spills | blog: Danger Blasts Ray J on Being Gay, Then Takes It Back. Danger Blasts Ray J on Being Gay, Then Takes It Back. Monica Leon aka Danger, from the first season of For The Love of Ray J, went on an L.A. radio show and tried to blast Ray J, saying that he's gay. Boo hoo. She claims that he and his lover, Young Buck, have been lovin' for years. And no, not the former G-Unit rapper, but one of Ray J's closest friends who goes by the same name. WARNING: the language is über explicit. 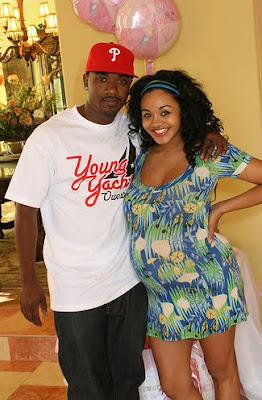 Now, if Im not mistaken, didn't Ray J attend her baby shower a couple months ago? And didn't she make a guest appearance on this season of For The Love of Ray J, claiming that they were "really close?" Hmmm. Coming from a psycho, who was just admitted to a Psychiatric Hospital, and had her newborn baby taken away from her? Girl, bye! We don't believe you, you need more people! UPDATE: Ma'am called into a Richmond radio station and tried to clear her name by admitting to lying about the situation. She says she lied because she was mad at Ray J. Hear it here.